Ants are rather amazing insects but that doesn’t necessarily mean that we want to share our home with them. When you stop to think about their abilities, however, it truly is awe inspiring. As a team, they work together to create their underground homes and they are able to carry multiple times their weight back to their home without ever complaining. Although they certainly are amazing, they can also be difficult when they enter our homes or gardens. Ants cause damage to the property and our plants as well. If they manage to get inside of the house, they will invade your food stock and carry it back to the Queen. They even have the ability to bite, making them even more of an unwanted invader. Many of us will step on an ant when we see it inside of our home but there may be other ways to handle the situation. In fact, when you look down through the following home remedies, you will see that there are a number of ways to get rid of ants and to keep them gone for good. Ants are known for their sense of smell and their odor receptors are five times more powerful than most insects. You can use it to your advantage. You may love the smell of cinnamon but ants hate it. Using cinnamon essential oil can act as a natural ant repellent that keeps them from coming in the door in the first place. – Add 1/2 teaspoon of cinnamon essential oil to a cup of water. 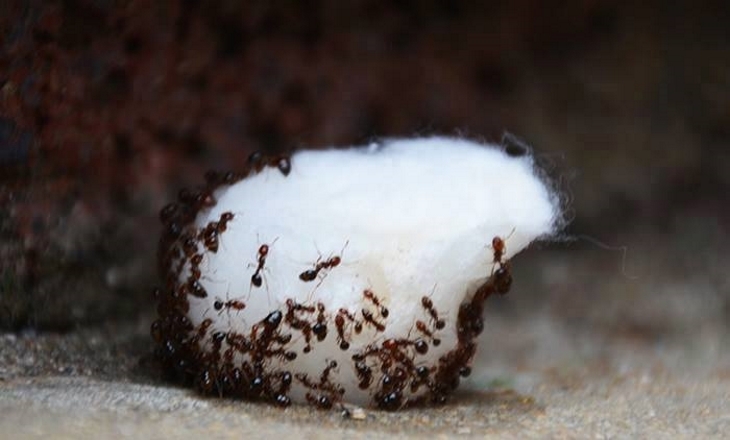 Dunk a cotton ball in the water, and use it to wipe down areas where the ants may live and dwell. Keep repeating this process once a day until the ants have vacated the premises! – Leave whole cinnamon cloves outside, especially around doors, windowsills, and other entryways. You can also fill a spray bottle with water and add cinnamon essential oil to spray it where an infestation happens. This one may seem a little cruel, but it does work quite well. Boil a big pot of water and put some ground cayenne pepper seasoning in it. Grab the pot with oven mitts and head outside. 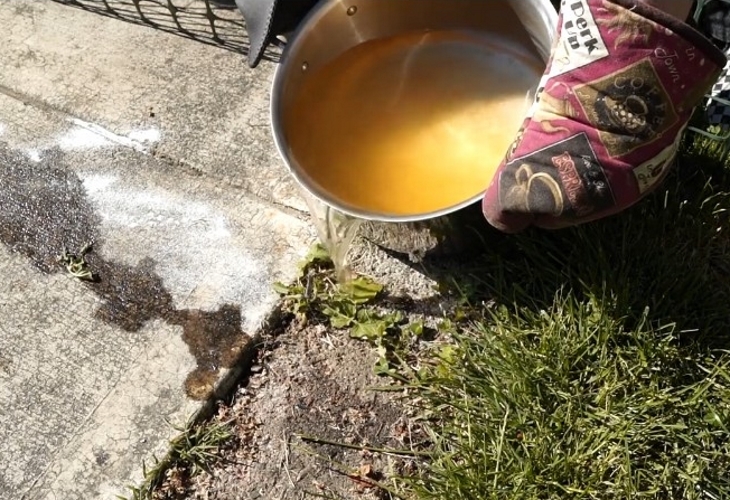 Pour the boiling spicy water where you see ant holes, including cracks in the sidewalk or where ants are heading underground. Vinegar is one of those scents that keeps ants running away. You can use it to your advantage. Fill a spray bottle with equal parts of water and distilled vinegar. Add a few drops of lemon essential oil. Shake the bottle before each use and spray it around baseboards or anywhere they like to come inside. Do it daily until they are gone. Ants love the sweet taste of sugar but they don’t love borax. It kills them, so what’s to love about it? Make this handy ant repellent with a combination of the two. – Add 1/2 cup of white sugar and 1.5 teaspoons of borax into an empty jar. – Add 2 cups of boiling water, and stir until the mixture has dissolved. 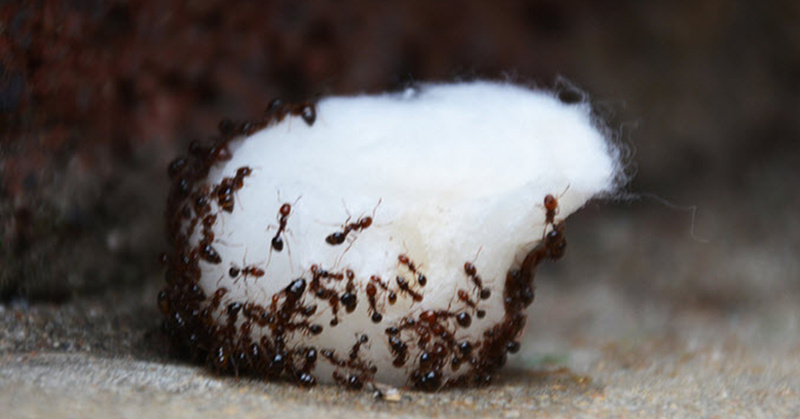 Soak cotton balls in the mixture and leave them out for the ants. Diatomaceous earth is a natural ant killer. It comes in the form of a powder but when seen under a microscope, there are razor sharp edges. You can find Diatomaceous earth in the gardening section at your favorite home improvement store. You can also purchase it online. Humans can eat it and it won’t harm animals but it is deadly to ants. Sprinkle the powder where you suspect the ants may be hanging out. This could include windowsills, under the refrigerator or around the garbage cans. End of story. There are many ways to get rid of ants naturally so why would you use chemicals from an exterminator? Try these non-toxic methods and be free.